Happy week after Thanksgiving, everyone! 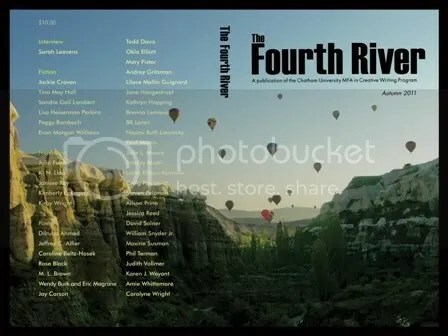 Just a quick announcement to say that my writing has been published in the new issue of Fourth River, a literary magazine based in Pittsburgh. And it’s IN PRINT. Sure, I’ve seen my writing in print before, but it’s typically been short columns, with creative stuff going up on the web. So there is something very satisfying about being able to hold my work in a bound magazine, to flip through the pages of familiar words (oh, so, so familiar, after much revision), and toss the weight of the printed volume down onto a table with a light thud. These are the moments when I feel like a real writer, not like someone in a delusional state who mistakenly pretends that anything they are scribbling down might actually ever be read by another human being. And to writer friends and readers, let’s keep producing our large volume of work together! I have only recently realized that the key to writing well and someday being satisfied with the work is just to KEEP WRITING, write deeply, write freely, and just write my heart out. These few and fleeting moments of external recognition remind me that it’s worth it to keep working, to write the stuff that I want to someday read, because it’s worth it. Even if only one other person reads my words and maybe cares a tiny bit about them. “Cities are my favorite natural expanse–a jungle of people, a forest of culture, an ocean of opportunity. And for me, subways most approximate the kind of motion that Newton described. Sometimes when I ride the subways of New York, I think about our train’s swift movement through the dark tunnels, and wonder: could a train really continue on forever in a vacuum, unhampered by such inconveniences as friction, inertia, or dirt on the track? Such hypothetical motion seems perfect. Occasionally, I can almost imagine what that kind of perpetual motion would feel like, when I stand on a Local train and hear the rumble of an Express gaining on us. The two trains thunder through the tunnel, until they meet and continue side by side, and for a second, I catch sigh of the passengers in the other car through the brightly lit oval windows. Then the Express roars by; our train seems to catapult backwards and for a moment, I feel myself suspended between time and space, floating. Um, LOVE the excerpt… really resonated with me, especially as I sit here exploring another great city’s public transpo system – Bangkok. HUGE congrats on the publication. Can’t wait to read it. Hugs. Congrats!! What a lovely thing to celebrate for the holidays! As stated above– great excerpt! It describes the ‘beginning’ so perfectly. Congrats on getting published, and I hope you had a great Thanksgiving! The opportunity to build yourself a new home can be an amazing, once-in-a-lifetime chance, so it is important to understand the process needed to borrow money to do so through the VA Home Loan Guaranty Program. and always look at the big picture.